Do you know what your plant need when and why ? Do you want your plants to be healthier and growing ? Now, Breeding flowers and trees is no longer a guessing game !!! 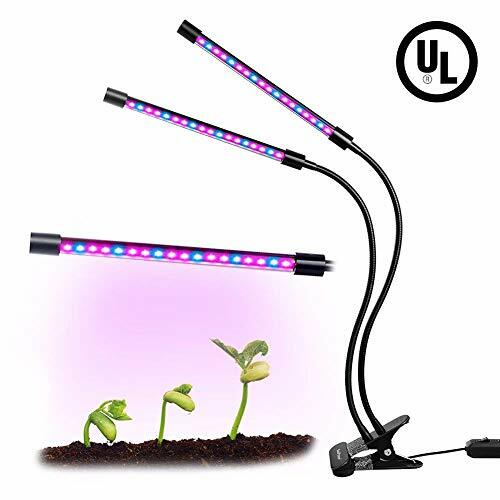 KooPower dual-lamp grow light can rapidly improve the health of plant and growing, leaves grooming within 2 weeks of using this growing lamp on a daily basis. At the same time , we have UL Certification Plug, 110V-220V , which others don't have. 6pcs Blue LEDs with wavelength of 460nm, Blue light is more necessary for Chlorophyll and Carotenoid which are necessary for healthy leaves; Good for photosynthesis; best for promoting the stem and leaf. 12pcs Red LEDs with wavelength 620-660nm. Red light is rich sources and more efficient; Beneficial for photosynthesis, best for blooming and fruits or seed production, and is the key for flowering plants. All kinds of flower plants: tomatoes, chilli, eggplant, rose ect. All kinds of greens: herbs and leafy vegetables, lettuce, bok choy, ect. Also suitable for indoor garden or indoor potted landscape. 1. Would be better to keep the distance between the light and plant about 70cm. 36 LED Beads & 2 Dimmable Levels : 36 LED Plant Growing Beads (24 red & 12 blue) .This upgrade version is ultra bright, lower heat and lower power consumption, high luminous efficiency and long service life. It has 2 Dimmable Levels brightness, you can adjust it according to plant needs. EASY TO USE: With the USB design, you can plug into a wall outlet（UL Certification Plug, 110V-220V） or an USB interface. The dual-lamp with 360-degree flexible neck and clamp is easy to adjust and place anywhere. The Wide linear light style allows it to cover a larger area and supply energy to more plants.